Hodgins and Angela wake up groggy to Michael Vincent crying and a corpse in a canopy dripping blood onto their faces. Flower petals surround MV, and Hodgins immediately suspects Christopher Pelant, as they are from Crocus sativus, used in ancient Egyptian rituals to the sun. Brennan comes out to the house to look at the corpse and determines from the superolateral corner of the eye orbit that the victim was male. Hodgins wants the investigation to be small and in-house, but Booth calls in the FBI and Brennan calls Saroyan to get a tech team to the house. Based on the corpse, Brennan estimates the victim to be 185.4 cm tall, and the weight of the corpse is 56.7 kg, which Saroyan estimates would have been about 210 lbs during life. Wear to the maxillary teeth (the mandible is missing) suggests to Brennan he was in his late 30s, and the width of the 4th sternal rib end suggests he was Caucasian. Fragments embedded in the iliacus muscle in the pelvis are old, likely shrapnel. Lesions to the scapula suggest cutaneous leishmaniasis, which he could have gotten from the bite of the sand flea. Stress fractures to the metatarsals are consistent with parachute jumping, and osteophytes on the intercondylar fossa of the femur resulting from nitrogen buildup in the blood suggest the man was also a deep sea diver. The man has been dead fewer than 24 hours. Meanwhile, Pelant is clearly back in the country and is mocking up an ID card to get himself into SERBERUS, a company that provides mercenaries throughout the world. Special Agent Flynn manages to get confidential information on one Xavier Freeman, a Navy SEAL who served in Iraq and was wounded by an RPG in Afghanistan. Freeman was special ops, which meshes with the old injuries that Brennan found to the body. 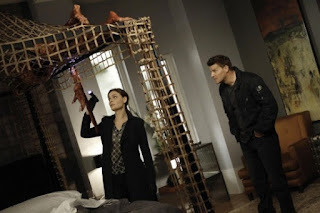 Booth and Flynn ransack his apartment and find an open gun safe with proprietary weapons; Booth recognizes these as related to SERBERUS. Unfortunately, the head of the company does not want to help Booth, instead claiming that they will ferret out Pelant themselves. The tox screen on Freeman's body comes back negative for poisons, but there was a significant amount of adrenocorticosteroids in his blood. Antemortem striations on the 4th and 5th cervical vertebrae are consistent with puncture wounds from a needle, Brennan suggests. These injuries could have compromised the nerve ganglions, leading to intense pain. Saroyan thinks that Freeman was tortured in this way repeatedly until he died of bradyarrythmia from the pain. Nothing from Hodgins' and Angela's blood screens comes back to indicate what was used to poison them, so the two snort lidocaine and biopsy their own lungs. The mass spec tells Hodgins that there was sevoflurane in their lungs, an anesthetic gas whose major local supplier is Cantilever, which Hodgins' family owns. Pelant calls Brennan to let her know to expect a hint. A mailroom worker finds a finger in an envelope addressed to her. Brennan and Saroyan immediately realize the finger is primate but not human. The flat nail suggests a member of Cercopithecidae, hair follicles are similar to a macaque, and the ratio of the distal to proximal phalanges indicates barbary "ape" (the barbary macaque is technically a monkey, but this is the common term). 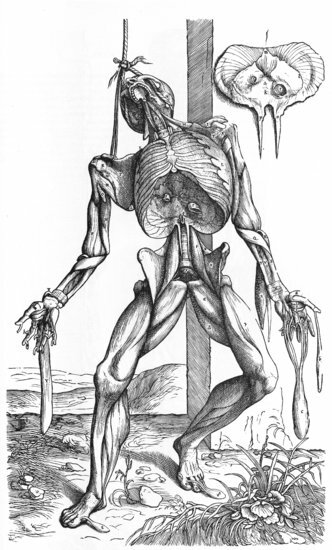 Brennan remembers that the Roman anatomist Galen used barbary macaques as dissection models for the human body, and notes that Galen's anatomy was current until Andreas Vesalius came along in the 16th century. Angela realizes that the corpse in her room was very similar to Vesalius' Plate 34 of De Humani Corporis Fabrica. Hodgins works some magic with his company and finds out that one Justin Trimple bought a lot of sevoflurane gas. Booth and Flynn suggest through an Enigma machine (because of course) that Angela should spam Pelant to distract him. Angela does so, and Pelant blocks her email; this lets her figure out what his server is, and through an IP trace, they realize he is at SERBERUS. Booth and Flynn gear up to get Pelant there with a full FBI team. Pelant taps into the security system, to make it look like he's walking in the building. Booth realizes there is a secret way out not on the blueprints, and the SERBERUS leader tells them where to find Pelant. Booth and Flynn chase him through the boiler room and into some machine room that empties into the parking garage, but Pelant has hooked up the A/C vent with a machine gun. Booth ducks in time, but Flynn gets hit (and fortunately is wearing body armor). Booth tracks Pelant into the parking garage and shoots at him, but only grazes him and does not stop him from escaping. Meanwhile, the Jeffersonian team compared Freeman's corpse to Vesalius' drawing and noted some dissimilarities. When they removed the muscles that Pelant left in Freeman's body, they get the letters (labels in the Vesalius drawing) MELYCU, which is an anagram for LYCEUM, the ancient Greek word for school. The servers at SERBERUS start spitting out code that no one there can decipher until Booth realizes it's MGRS code (military grid reference system), suggesting Pelant has a specific target. Angela tracks the MGRS to Kandahar province and realizes Pelant has hacked into an MQ9 predator drone. They figure out the target: a girls' school. Hodgins then realizes what the other code on the SERBERUS server is: his account numbers and passwords. Pelant is draining his bank accounts, making him choose between saving the girls (by staying in the SERBERUS computer system to control the drone) and saving his money (by disconnecting). Hodgins chooses the girls, and Angela manages to make the drone self-destruct at the last minute, saving the girls. In the end, Flynn is in stable condition, Hodgins and Angela have no money (except, presumably, their very well-paid jobs at the Jeffersonian), and Pelant has killed a veterinarian to get supplies to suture the fairly superficial lacerations to his face. Just one single drop of blood fell on Hodgins' face? Out of that whole, flayed, bloody mess? One corner of the eye orbit suggests to Brennan the victim was male? So males tend to have more square-shaped orbits than females, so theoretically the superolateral (did she say "superiolateral"?) corner could be more of a right angle, but... yeah, no. The victim was 185.4 cm tall? That is really specific. Where are your error bars, Dr. Brennan? Dental wear is really complicated in this day and age. Sure, there has been a lot of use of it in bioarchaeology, where we know people within a population were eating pretty much the same thing, but the combination of soft food, variety in food, and good dental practices in modern society means dental wear is highly variable. I wouldn't trust it to give me any sort of precise range for age-at-death of modern people. But kudos to the prop team for actually getting some worn teeth (and they're teeth that are worn to about the mid-30s based on bioarchaeological data). Impressive. I've never heard of assessing ancestry from the sternal rib ends, just age-at-death. I can't immediately find anything in Google scholar either. Anyone have any idea? I'm just calling shenanigans for now. How does Brennan know that the osteophytes on the femur are from nitrogen buildup rather than, oh, arthritis, which would have been totally normal in an athletic male in his late 30s who jumped out of airplanes? And the stress fractures to the metatarsals... I suppose they're consistent with parachute jumping, but just last week there was a case with stress fractures to the metatarsals that were consistent with dancing. Lazy writing, not giving Brennan any sort of differential. She just goes for some randomly specific activity, when that's not what musculoskeletal markers tell you. Strange that the writers didn't specifically reference the flower code from the last Pelant episode. His leaving flower petals in MV's crib was a code, right? The petals seemed to have different markings as well. Why weren't those investigated for meaning? I guess Pelant is supposed to be a super villain, but don't you think Hodgins - who is super paranoid - would have tons of security? And maybe a couple people working for him in his ginormous house? I don't know why Saroyan thinks it's ok for Hodgins and Angela to be working this case. Sweets agrees with me, but Saroyan totally disses him by saying that Pelant is scared of Hodgins and wants him off the case, thereby out-psyching Sweets. Burned. Booth sets up some sort of AET(?) counter-surveillance super-shield, but... Pelant gets through it anyway? Didn't see the point of that part of the plot. What was the point of having an Enigma machine, other than that they're really freaking cool? Hodgins wanted to work off the grid, but they kept calling on cell phones. Anyway, he says that there are only two in the world, but that's not true at all. And the writers didn't seem to understand how an Enigma machine actually worked either. It's always annoying when Angela, who talks constantly about being an artist, is suddenly the world's greatest computer hacker. She out-hacks Pelant. She does things with computers that would take teams of people days to do, and she does them in a matter of seconds. Sure, she can just hack into SERBERUS's computers and into the predator drone faster and more easily than the FBI and SERBERUS's own tech people. Easy peasy! How does SERBERUS have a giant building if they're a company of mercenaries? I mean, is that legal? Wouldn't at least some of Hodgins' money be FDIC insured? Or, you know, bound up in stock that can't be transferred at the click of a button? Did we get an explanation for the meaning of SERBERUS? I mean, I know it's a play on Cerberus (or, as my friend Ben used to jokingly pronounce it in high school Latin class, "CAAAARE-bear-oooos! "), the guardian of the underworld, but why is it all caps, and why does it start with an S? Pronunciation -- Saroyan says "il-EYE-a-cus," which I'd never heard, but Merriam-Webster supports it. (It's near the ilium, and iliac is pronounced "ILL-ee-ack," so I thought it was "il-ee-AH-kus.") And I think Brennan was trying to pronounce Cercopithecidae but did actually horribly butcher it with something like "sick-o-path-EE-ke-dee" rather than "ser-co-pith-eh-SEE-dee" (in English, anyway; Latin/Greek is slightly different). Alright, M-W has something weird here too. I honestly don't know who pronounces these words the way M-W does; certainly not forensic or biological anthropologists. "Take a breath..." Hodgins, having his a-ha House or Monk moment. Forensic Mystery - A. Pretty good mystery tonight. Not really as to the victim's identification, since that came out fairly early on. But with any "big bad" episode, the focus is on the message the villain is trying to send. So watching the Jeffersonian attempt to figure out what Pelant was up to was interesting. Forensic Solution - B. I'm going to ding them here because of all the wonkiness with the forensic techniques. It was just all too easy and simple, when forensic anthropology is only very rarely that straightforward. Drama - A+. Judging by my lack of notes at the end of the episode, this was quite good from a dramatic standpoint. This is the kind of Bones I like to see, and it's no surprise, really, because the writers are generally excellent when it comes to serialized episodes (e.g., Grave Digger). The threat to Hodgins and Angela felt real, the characters' reactions to the threat were appropriate, Flynn gets gunned down, and Pelant gets away. Good job, Bones writers! In spite of my quibbles above, it was a thoroughly enjoyable hour of television that didn't make me want to hurl stuff at my screen. More, please. I wondered where Hodgins' money went. It can't just go away. They didn't even try and trace it. And who would think that he would chose the money over the kids' lives? you making a comment, like you just way better than the story writer/the director. people make mistake, and there are no such a tv series or even movie can make a perfect story line, well perfect at everything. go make your own movie or tv series and try to make it perfect. hahaha your comment about this serial is waaayyy to serious dude! I'm guessing the last two comments are the same person, because they're within a minute of each other and I can't bloody understand what they're saying. That said, is no one batting an eye at the in-home-biopsy scene? Oh, I'm totally batting an eye at the in-home biopsy scene. He goes to Cam to take his arterial blood gases, but is going to do a lung biopsy himself? (I'm guessing via bronchoscopy since he was trying to suppress his gag reflex). Does Hodgins not have access to viscous lidocaine? Because you don't snort lidocaine to suppress a gag reflex. Even ENTs who still use cocaine for anesthetic purposes use it in solution form and apply it soaked on pledgets, never via snorting. How does a botanist (entomologist/mineralogist) have any skill to perform this on himself and Angela and do it without inducing a pneumothorax? As ridiculous as Angela's Magic Computer skills may be, it's established canon from the pilot that The Angelator always plays a role in saving the day for the team, and I expect that. But the botanist having the knowledge to perform thoracoscopic procedures on himself is a whole 'nother thing altogether. Also - wouldn't you think that the guy who is ceaseless paranoid about Big Government would have his money and holdings diversified into some accounts that are offshore and untraceable? They're all easily accessible on one screen? Really? Yet, even despite those nitpicky quibbles, it was actually a good episode for a change. Probably the best in 2 seasons even with all of its warts. I know Bones made a name for itself by being a quirky dramedy, but they do drama better than they do goofball slapstick. Also, ill-ee-ACK-us is the pronunciation that I've always heard in my work on the medical side. I actually didn't catch Cam's pronunciation when I watched the episode, and the mispronunciations usually stand out to me like a sore thumb. I agree, that home-biopsy is weird (but probably makes sense in a increasingly silly series). As to the (mis)pronunciation: I have always been taught To stress the third syllable from the end in latin words (including anatomical and species' scientific names and such). Saroyan/Brennan/M-W sound ok to me. @ Dr. Killgrove, I'd like to comment on your statement about the security at Hodgins' house. Remember he moved before the baby was born because Angela wanted to have their own house that they could build together. So Hodgins bought the house of the victim's "friend/stalker." That was on Season 6 episode 10. So I'm guessing that he doesn't have the full security like he would have at his old house. And to everyone that says that Hodgins might not have the skill set to do the lung biopsy himself, remember that he has 4 degrees, one of them being in forensic chemistry. While that might not mean that he has the knowledge to do a biopsy, I'm sure when he was studying entomology he had to do something along that line. Besides Brennan, Hodgins is the smartest one on the team now that Zack is gone (I'm still very sad about that). In real life, what would happen to someone who commits multiple murders and hacks multiple federal government databases after they erase all evidence that they are a US Citizen? Hodgins losing all his money was just a stupid bit by the writers to get the viewers more engaged and pissed at Pelant. Realistically the money would be insured, and Hodgins and Angela would never end up with nothing. Writers tried to make me pissed at Pelant but I'm just mad at them. Again for the 4th time because this blog keeps backing me out. Episode 8 season 12 really pisses me off they say that they are in Newfoundland I'm from Newfoundland nothing in this episode shows are in from Newfoundland except for one part. Were they are driving down St Johns Harbor. Other than that there is nothing no one has the proper accents there is not a proper buildings and not to mention the killer's father is obviously from Manitoba way he pronounces his o's. The cop is clearly from Scotland. Newfoundland accent is a mix of Irish and British and nothing supports this.